Today was supposed to be an 8 mile walk/run day but it looked like it was going to rain so I decided to put my workout off until tomorrow. I started the day with a haircut, which was badly needed. Then I headed to The Woodlands’ Market Street. When I got there, I noticed a small shop called The Cupcakery. Uh oh…Yep I gave in. Bad Tammy…I know…and unfortunately, it wasn’t at all worth it. It was dry and tasted like a cupcake bought at Krogers. It was a fun little place though. I did very well in my first month of eating Paleo and lost 12 pounds. Unfortunately, I’ve lost a little motivation to stay away from all unapproved foods because I had made my 30 day mark. Needless to say, my eating poorly 1 day a week for the past 3 weeks has led me to making poorer and poorer food choices. So, I decided to find another motivational tool. I found this adorable dress that is my goal size (final size). Isn’t it beautiful!! 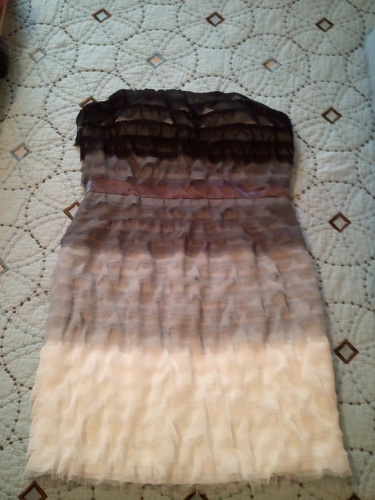 I have big plans for this dress when I can fit into it. Now, I just have to figure out where I’ll wear it to! Tomorrow I’ll begin eating strict Paleo again. Time to get my eating back under control. I’ve let myself down, especially when I see the trend getting worse again. There’s a reason I was 250lbs at one time. This entry was posted in Challenge and tagged Goals, oops on February 19, 2011 by Tammy. That dress is amazing! And you’re right, The Cupcakery is not all that. 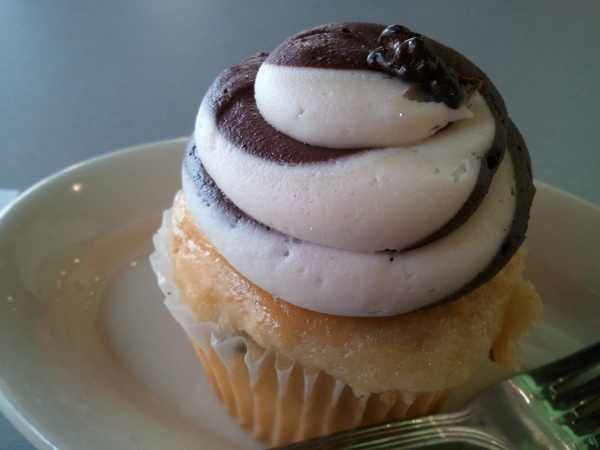 I did a blog post on it recently, too, comparing three locals bakeries–they ranked last. At least your frosting stayed on…mine fell off before I got it home. Thanks for the comment today, Tammy! 🙂 Much appreciated! Meanwhile, here I am drooling over that dress– it is absolutely divine! And I know you will be stunning in it. Thanks, Elizabeth! I can’t wait to slip into it! !